The Muses are the Greek goddesses who preside over the arts and sciences and inspire those who excel at these pursuits. Daughters of Zeus, king of the gods, and Mnemosyne ("memory"), they were born at Pieria at the foot of Mount Olympus. Their nurse, Eupheme, raised them along with her son, Crotus the hunter, who was transported into the sky as Sagittarius upon his death. 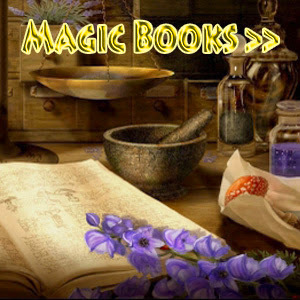 Their name (akin to the Latin mens and English mind) denotes 'memory' or 'a reminder', since in the earlier times poets, having no books to read from, relied on their memories. The Romans identified the Muses with certain obscure Italian water-goddesses, the Camenae. The original number of muses and their names varies in earlier times as their evolution blossomed in Greek mythology. At first, three muses were worshipped on Mount Helicon in Boeotia: Melete ("meditation"), Mneme ("memory"), and Aoede ("song"). Another three were worshipped at Delphi and their names represented the names of the strings of a lyre: Nete, Mese, and Hypate. Several other versions were worshipped until the Greeks finally established the nine muses in mythology as: Clio (History), Urania (Astronomy), Melpomene (Tragedy), Thalia (Comedy), Terpsichore (Dance), Calliope (Epic Poetry), Erato (Love Poetry), Polyhymnia (Songs to the Gods), Euterpe (Lyric Poetry). Ephialtes and Otus, who also founded Ascra, were the first to sacrifice on Helicon to the Muses and to call the mountain sacred to the Muses. Sacrifices to the Muses consisted of libations of water, milk, or honey. Their companions are the Charities, the Horae, Eros, Dionysus, Apollo, Aphrodite, Harmonia, and Himerus (Desire). Apollo is the leader of the choir of the Muses and consequently he has the surname Musagetes. Athena caught and tamed the winged horse Pegasus and gave him to the Muses. Some of their disciples included the Sphinx who learned her riddle from the Muses, Aristaeus, who learned the arts of healing and prophecy from them, and Echo, who was taught by them to play music. In Plato's Phaedrus, Socrates says the locusts used to be men before the birth of the Muses. When song appeared when the Muses were born, some men were so overcome with delight that they sang constantly, forgetting to eat and drink until they eventually died. These dead men became locusts with a gift from the Muses allowing them to sing continuously from their birth until death without the need of sustenance. When they die, the locust go to the Muses and report which men on earth honors each, endearing a worshipper to the Muse he follows. The Muses could be vindictive like in the story of the contest with Thamyris. Thamyris who excelled in minstrelsy challenged the Muses to a musical contest at Dorium in Messenia, the agreement being if he won he would take pleasure from all of them. The Muses won the contest, and bereft Thamyris of his eyes and minstrelsy. In another story, the king of Emathia (Macedonia) and his wife Euippe had nine daughters and named them after the Muses. The daughters entered a contest with the Muses, were defeated and were metamorphosed by the Muses into birds called Colymbas, Iynx, Cenchris, Cissa, Chloris, Acalanthis, Nessa, Pipo, and Dracontis. These names were taken from actual names of birds such as the wryneck, hawk, jay, duck, goldfinch, and four others with no recognizable modern equivalents. In yet another myth, it was said Hera, queen of the gods, persuaded the Sirens, who were described in early Greek mythology as having the bodies of birds and heads of beautiful women, to enter a singing contest with the Muses. The Muses won the competition and then plucked out all of the Sirens' feathers and made crowns out of them. Many places were dedicated to the Muses such as the famous Valley of the Muses - Thespies on the eastern slopes of Mt. Helikon began it's "Mouseai" festivals in the 6th c. B.C. It was organized every 5 years by the Thespians. Poets and musicians from all over Greece also participated in various games (epic, poetry, rapsodia, kithara, aulos, satyric poetry, tragedy and comedy). It was common for ancient schools to have a shrine to the Muses called mouseion, the source of the modern word 'museum.' The famous Museum of Alexandria, founded by Ptolemy I, was a temple dedicated to the Muses. Before poets or storytellers recited their work, it was customary for them to invoke the inspiration and protection of the Muses. LAMA is the Sumerian Goddess of intercession and protection. Also known as LAMASSU by the Akkadians, she acted as an intermediary between people and the Gods. Lama was usually depicted in human form, often appearing on seals introducing a king to a God or Goddess. 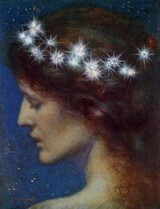 In this form, she wore a long tiered robe and sometimes a horned tiara. As Lamassu, she was more often portrayed as a winged bull or lion with a woman's face, and served to protect temples and palaces. Lamassu is often confused with Lamastu, an Akkadian demon Goddess. Lama's name means "protective spirit." "RATI" IS THE HINDU GODDESS OF LOVE, PASSION, DESIRE, AND PLEASURE; HER NAME MEANS SEXUAL DELIGHT, AND HER PASSION INSPIRING POWERS SHARE SIMILARITIES TO THE ROMAN GODDESS OF LOVE, "VENUS", BUT UNLIKE "VENUS, RATI "IS NOT ALWAYS DEPICTED AS THE BEAUTIFUL, PERFECTLY SHAPED WOMAN. INDEED, SHE IS OFTEN SHOWN AS A HEAVILY PREGNANT WOMAN. 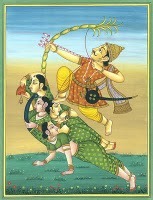 SHE IS THE FEMALE COUNTERPART OF "KAMADEVA", THE GOD OF LOVE AND DESIRE; SOME COMPARE HIM TO "CUPID." 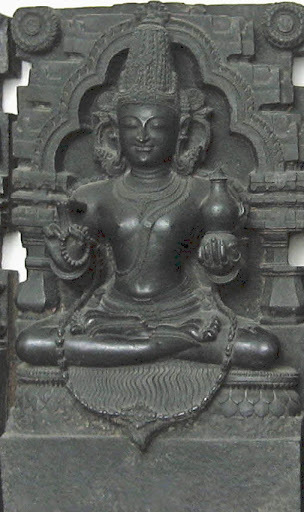 SHE IS THE DAUGHTER OF THE SUN GOD, "DAKSHA, "YET, EVEN THOUGH SHE WAS BORN FROM THE ELEMENT OF FIRE," RATI "IS ASSOCIATED WITH THE ELEMENT OF WATER AND IS OFTEN ASSOCIATED WITH THE WATER GODDESSES KNOWN AS THE" APSARAS, "THE NYMPHS OF PARADISE", "WHO ARE RENOWNED FOR THEIR BEWITCHING, SHAPESHIFTING POWERS. IN FACT, IT IS BELIEVED THAT THEY POSSESSED THE POWERS TO SHAPE SHIFT INTO ALMOST ANYTHING THEIR HEART, OR THAT OF THEIR COMPANIONS, DESIRED. THE "ASPARAS" FREQUENTLY TAKE ON THE APPEARANCE OF SEDUCTIVE WOMAN WITH LONG, DARK HAIR. THEY ARE IMPOSSIBLE TO RESIST WITH THEIR IRRESISTIBLE BEAUTY AND SEDUCTIVE TALENTS AND CAN TEMPT THE CELIBATE TO GIVE UP THEIR SOLITARY WAYS. SOME BELIEVE THESE ENCHANTRESSES SERVE AS ATTENDANTS TO "KAMADEVA. " AMAUNET is the Egyptian Goddess of the air, the consort of Amun and one of the original eight Egyptian Gods, called the Ogdoad. She ruled over the north wind, which was very important to Ancient Egyptians in that it provided them a way to sail upstream on the Nile. Amaunet was honored as a protector and teacher of the royal family, playing an important role in accession rituals. It was said that her shadow protected both the pharaoh and the Gods. Amaunet was depicted either as a snake-headed woman (as were the other Goddesses of the Ogdoad), or in fully human form wearing the red crown of Lower Egypt. 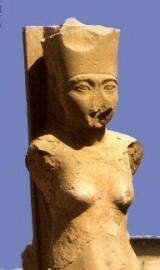 Her name, which means "female hidden one," is also seen as AMANUNET, AMUNET, and AMONET. Erlik, or Erlig, is the god of death and underworld in Turkic and Mongolian mythology. According to Siberian mythology, Erlik was the first creation of Tengri or Ulgan, the creator god, but Erlik's pride led to friction between the two, and he was banished to the underworld. 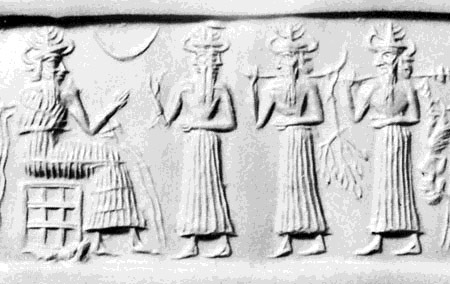 In the myths of the Altaic peoples, Erlik was involved in the creation of humanity. He slew the messenger-god, Maidere, and is a teacher of sin. He is sometimes represented by a totemic bear. In Turkic mythology, Erlik was the deity of evil, darkness, lord of the lower world, and judge of the dead. He is known as the first of mankind, created by Ulgen. He wants to be equal to Ulgen, but is in a position inferior to him. Then he wanted to make his own land and was sent to the prison at the 9th layer of the earth and became opposed to the upper world, the realm of light. 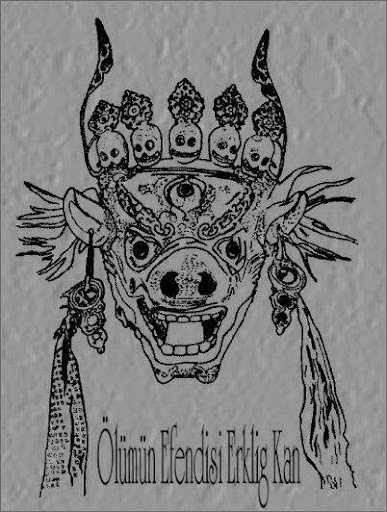 The evil spirits created by Erlik cause misfortune, sickness, and death to mankind. These spirits are imagined as Erlik's assistants. Besides these, his 9 sons and daughters help their father in the way of evil. Erlik's daughters especially try to change a shaman's mind while he is attempting to reach Ulgen with their beauties. Erlik gives all kinds of sickness and wants sacrifices from the people. If they do not sacrifice to him, he catches the dead bodies of the people that he killed and takes them away to this lower world and then makes them his slaves. So, especially in the Altays, when sickness appears, people become scared of Erlik and sacrifice him a lot of animals. In the prayers of shamans, Erlik is described as a monster, having the face and teeth of a pig combined with a human body. Besides his face, he is an old man with a well-built body, black eyes, eyebrows, and mustache. Long ago, the prophet known as Living Tarim brought Erlik worship to a group of Hyrkanian tribes who, with the strength of their religious fervor, swept down and founded the Turanian Empire. Erlik is a harsh god who believes in tempering the soul through trials and deprivation. However, most of his priests do not take these things to heart. The Hyrkanian god Erlik is a figure shrouded in mystery and legend. Even though he is the supreme deity of the Hyrkanians and their younger kin, the Turanians, very little is known about Erlik. According to Hyrkanian myth, Erlik was the first man on earth, but he was not given a soul by the Creator. When Erlik tried to create life by himself, he was banished into the depths of the earth, where he claims the dead ("those that lack breath") for his own. Erlik is also known under the title "the God of the Yellow Hand of Death". Erlik would be a minor god were it not for the prophet known as Living Tarim. Tarim brought Erlik worship from a remote region known as Pathenia to a group of Hyrkanian tribes who, with the strength of their religious fervor, swept down and founded the Turanian empire. Erlik is a harsh god, who believes in the tempering of the soul through trials and deprivation. His tenets, as revealed by Tarim, forbid fornication, the consumption of alcohol and usury. However, even most of his priests ignore these precepts. Erlik's avatar is the Living Tarim. The avatar appears as a human form whose face and features are cloaked by a hooded robe. It is said that he sits on a throne in the inner sanctum of Erlik's domed temple in Aghrapur. 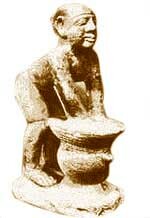 Idols of Tarim depict him as a one-armed male. Clerics of Erlik (and Living Tarim) who follow the strict codes of the Revelations of Tarim are able to master terrible necromancy. Among their powers is the ability to sink into the earth and command undead. Priests of Erlik must always be male. Damu is a god of vegetation and rebirth. He is a son of Enki and Nininsinna, and he kept the sap flowing and helped to regulate the death-rebirth cycle of nature. Damu also seems to be a local offshoot of Tammuz. The Erinyes generally stood for the rightness of things within the standard order; for example, Heraclitus declared that if Helios decided to change the course of the Sun through the sky, they would prevent him from doing so. But for the most part they were understood as the persecutors of mortal men and women who broke "natural" laws. In particular, those who broke ties of kinship through patricide, murdering a brother (Fratricide), or other such familial killings brought special attention from the Erinyes. It was believed in early epochs that human beings might not have the right to punish such crimes, instead leaving the matter to the dead man's Erinyes to exact retribution. The goddess Nike filled a similar role. When not stalking victims on Earth, the Furies were thought to dwell in Tartarus, where they applied their tortures to the damned souls there. 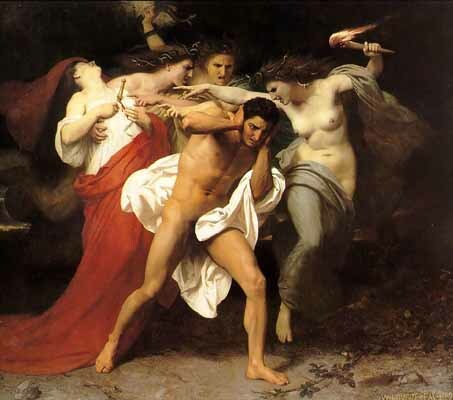 The Furies (their Roman name) or Dirae ("the terrible") typically had the effect of driving their victims insane, hence their Latin name furor. Virgil VII, 324, 341, 415, 476. Mangala is the name for Mars, the red planet. Mars is also called Angaraka ('one who is red in colour' or Bhauma in Sanskrit. He is the god of war and is celibate. 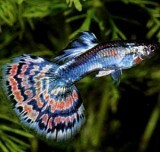 He is considered the son of Prithvi or Bhumi, the Earth Goddess. 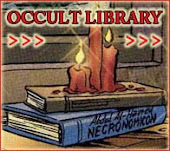 He is the owner of the Aries and Scorpio signs, and a teacher of the occult sciences. He is painted red or flame colour, four-armed, carrying a 'trident', 'mace', 'lotus' and a 'spear'. His 'mount' is a ram. He presides over 'Mangala-varam'. 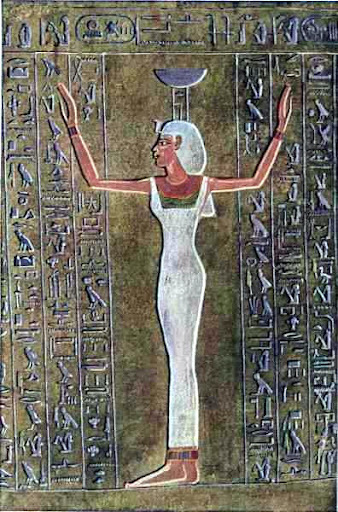 NEPHTHYS IS THE EGYPTIAN GODDESS OF THE DEAD. HER NAME MEANS "MISTRESS OF THE HOUSE" IN THE EGYPTIAN LANGUAGE. SHE HAS ALSO BEEN CALLED THE "FRIEND OF THE DEAD". NEPHTHYS IS THE SHADOW OF HER SISTER ISIS AND RULES OVER THE DARKNESS AND THE SECRETS OF DEATH. SHE IS THE PROTECTOR OF SOULS AND THE QUEEN OF THE UNDERWORLD. SHE IS USUALLY DEPICTED AS A WOMAN WITH THE HEIROGLYPHIC SYMBOLS OF HER NAME SITUATED ATOP OF HER HEAD; THIS WOULD BE A BASKET AND A HOUSE. SHE HAS ALSO BEEN DEPICTED AS A BIRD....A FALCON OR A HAWK. THROUGHOUT ANCIENT EGYPT, SHE WAS ASSOCIATED WITH THE FUNERARY RITUALS AND WAS NOT REVERED AS DEATH ITSELF, BUT INSTEAD AS A COMPANION WHO OFFERS GUIDANCE TO THE NEWLY DECEASED AND COMFORT TO THE LIVING RELATIVES. 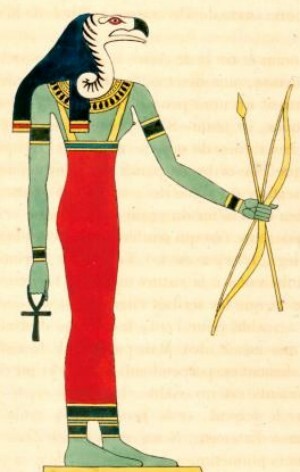 IN MOST ANCIENT EGYPTIAN MYTHS, SHE IS INTRODUCED TO US AS THE DAUGHTER OF NUT, SISTER OF ISIS AND OSIRIS, AND THE SISTER CONSORT OF THE GOD, SET. LATER MYTHS PROCLAIM HER TO BE THE MOTHER OF ANUBIS. HIS FATHER WAS OSIRIS. SOME MYTHS SAY THAT SHE INTOXICATED OSIRIS AND SEDUCED HIM. STILL OTHER MYTHS SAY THAT SHE DISGUISED HERSELF AS ISIS AND BECAME PREGNANT FROM HIM. IT WAS HER ADULTERY THAT ENRAGED SET AND BECAME HIS MOTIVE FOR SLAYING OSIRIS. AND AFTERWARDS, SHE ONCE AGAIN BETRAYED SETH BY LEAVING HIM TO JOIN ISIS IN THE SEARCH FOR OSIRIS BODY PARTS. ALTHOUGH LINKED WITH DEATH AND DECAY, SHE ALSO HAD CONNECTIONS WITH LIFE AS WELL. IT IS SAID THAT, AS A COMFORTER, SHE STOOD AT THE HEAD OF THE BED TO OFFER COMFORT AND ASSISTANCE TO THE MOTHER WHO WAS GIVING BIRTH...WHILE ISIS STOOD AT THE FOOT OF THE BED TO MIDWIFE THE CHILD. IN FACT, THE TWO SISTERS WERE OFTEN FOUND TOGETHER, AND THE ONLY WAY THEY COULD BE TOLD APART WAS BY THE HIEROGLYPH ON THEIR HEADS. 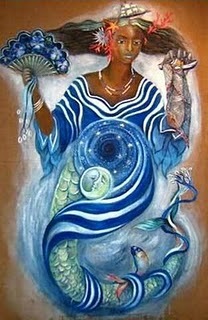 YEMAYA IS A WEST AFRICAN MOTHER GODDESS. HER FOLLOWING LATER SPREAD TO THE WEST INDIES AND BRAZIL AS WELL AS SOME PARTS OF EUROPE. SHE IS A GODDESS OF SEA, AND THE MOTHER OF ALL LIFE BECAUSE THE SEA IS THE SOURCE OF LIFE. 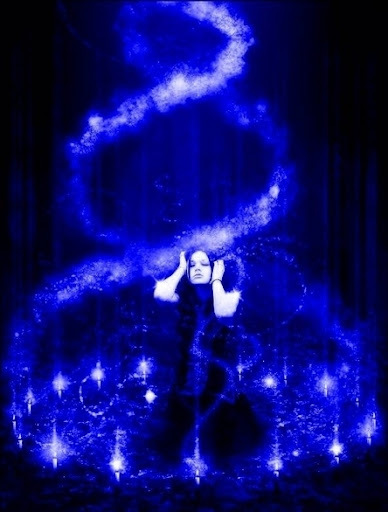 SHE IS ASSOCIATED WITH THE CRESCENT MOON, THE OCEAN, SEAS AND LAKES, DREAMS, ANCIENT WISDOM, AND FEMALE MYSTERIES. SHE IS USUALLY PORTRAYED AS BEAUTIFUL WOMAN, THE ULTIMATE SYMBOL OF MOTHERHOOD. HER BREASTS ARE FULL AND LARGE FROM GIVING BIRTH TO SO MANY DIFFERENT CREATIONS. SHE IS A FIERCE PROTECTOR OF WOMEN, SO IF YOU OR YOUR DAUGHTER FIND YOURSELF IN SOME SORT OF DANGER, BE SURE TO CALL ON YEMAYA FOR PROTECTION. YEMAYA IS OFTEN DEPICTED AS EMERGING FROM THE SEA COVERED IN SHELLS. THE COWRIE SHELL IS HER SYMBOL, AND FISH ARE SACRED TO HER. SHE IS THE KEEPER OF THE FEMALE MYSTERIES AND GUARDIAN OF WOMEN EVERYWHERE. IT IS SAID THAT THE FIRST TIME SHE WALKED UPON THE EARTH, FOUNTAINS WHICH LATER BECAME THE RIVERS AND LAKES SPRANG UP WHEREVER SHE WALKED. SEA SHELLS FROM WHICH HER PRIESTESSES COULD HEAR THE VOICE OF THE UNIVERSE WERE AMONG HER FIRST GIFTS TO HER PEOPLE. HER COLORS ARE BLUE, SILVER, AND WHITE...JUST LIKE HER BELOVED WATERS. HER JEWELS INCLUDE CRYSTALS AND PEARLS. WEAR PEARLS OR CRYSTAL BEAD TO INVOKE HER. SHE IS CELEBRATED ON FEBRUARY 2ND WHEN LETTERS OF REQUEST TO YEMAYA ARE TOSSED INTO THE OCEAN, AND DECEMBER 31ST WHEN OFFERINGS ARE MADE TO HER. SHE WILL BLESS YOU IF YOU MAKE OFFERINGS OF COPPER TO HER; SHE LOVES SHINY NEW PENNIES. IF YOU MAKE A CANDLE OFFERING TO HER, BE SURE TO PUT THREE SHINY PENNIES WITH THE CANDLE FOR EXTRA ENERGY. INVOKE YEMAYA FOR BLESSINGS, WISDOM, FERTILITY, MOTHERHOOD, SEA SPELLS, WATER MAGIC, AND PROTECTING YOUR HOME. 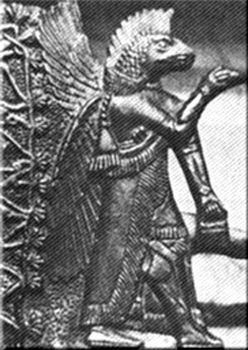 Birdu or Bubu'tu is a god of the underworld, worshipped by the Babylonians and Akkadians. He is the consort of Manungal and was syncretised with Nergal. Not much information exists on Birdu because most texts concerning him are found either damaged or incomplete. TO THE EARLY CELTS, DARKNESS WAS ASSOCIATED WITH NEW BEGINNINGS, THE POTENTIAL OF THE SEED BELOW THE GROUND, AND IN CELTIC MYTHOLOGY, THE WISDOM OF DARKNESS IS OFTEN EXPRESSED BY POWERFUL GODDESS FIGURES. 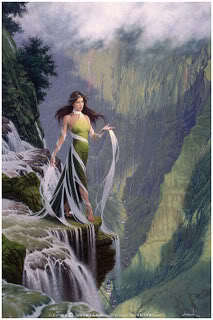 A DARK GODDESS OF NATURE, PARTICULARLY IN SCOTLAND, IS THE" CAILLEACH". SHE IS THE ANCIENT EARTH HERSELF. THE BARE EARTH COVERED WITH SNOW AND FROST. SHE IS THE DEATH GODDESS, WHO LETS DIE WHAT IS NO LONGER NEEDED. "SAMHAIN" USHERS IN THE REIGN OF THE "CAILLEACH BHEUR," THE BLUE-FACED HAG QUEEN WHO RULES OVER THE THREE MONTHS OF THE WINTER SEASON. HER NAME MEANS THE "VEILED ONE..."ONE WHO BELONGS TO THE HIDDEN WORLDS." BHEUR "MEANS "SHARP" OR "SHRILL"; HENCE,SHE PERSONIFIED THE CUTTING WINDS AND HARSHNESS OF THE NORTHERN WINTER. SHE IS REBORN ON EVERY "SAMHAIN WHEN" THE EARTH IS BEGINNING TO DIE; SHE IS THE PERSONIFICATION OF WINTER. IT IS THE "CAILLEACH" WHO RULES THE TIME BETWEEN THE LAST HARVEST AND THE BEGINNING OF SPRING WHEN HER REIGN IS BROKEN BY THE APPEARANCE OF BRIGID AND THE SACRED FIRES AT IMBOLC. SHE IS TYPICALLY DEPICTED AS A ONE-EYED OLD WOMAN WITH BAD TEETH AND MATTED HAIR. SHE LIVES IN A CAVE BELOW THE 'MOUNTAIN OF SNOWS' AND CARRIES A MAGICAL STAFF, AND WHEN SHE STRIKES THE GRASS, IT TURNS INTO BLADES OF ICE; AND THEN, ON "BELTANE" EVE, SHE TOSSES HER STAFF UNDER A HOLLY TREE AND RETURNS TO EARTH IN THE FORM OF A GREY STONE. THE ANCESTORS SAY THAT THIS IS WHY GRASS DOES NOT GROW UNDER THE HOLLY TREES. SOME ACCOUNTS SAY THAT SHE TURNS INTO A BEAUTIFUL MAIDEN INSTEAD. SHE WAS ALSO GUARDIAN TO ANIMALS THROUGHOUT THE WINTER. THE PROTECTOR OF WOLVES AND DEER, SHE IS HONORED BY HUNTERS LOOKING TO FEED ON FRESH MEAT DURING THE DARKNESS OF THE YEAR. HER SACRED TREES ARE THE HOLLY AND THE GORSE BUSH. 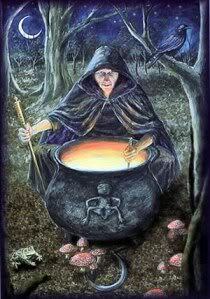 IN CELTIC MYTH AND LEGEND, THE HAG IS OFTEN EQUATED WITH THE SOVEREIGNTY OF THE LAND. IN A FESTIVAL KNOWN AS "REIGN OF THE OLD WOMAN", THE "CAILLEACH" IS CELEBRATED ON THIS DAY. "THE OLD WOMAN OF BEARE. The tides of time run out. "THE " HAG OF BEARE!" Once donned a queenly smock. Ye churls! to-day ye worship pelf! We loved our lovers then! Held in by curb and rein. "I ENVY NOT THE OLD,"
"AMEN! AND WOE IS ME!" Time makes an end of all! "I HAD MY DAY WITH KINGS!" Than shrivelled hags, hag though I am, I pine. Thy flood-tide foams to land. It will be time to go! "BONY MY ARMS AND BARE"
Could you but see them 'neath the mantle's flap. When kings lay in my lap. "'TIS, "O MY GOD" WITH ME,"
I'd say them, every one. Yet he comes not to-day. Deeply they sleep and long. Yet lies the hand of silence on them all. 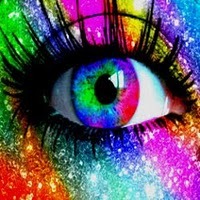 "I DO NOT DEEM IT ILL"
To me, when all is said. "MY VERY CLOAK GROWS OLD"
The sea-wave comes not after ebb for me. My tide will turn no more." --ELEANOR HULL-- "
"HEMERA" IS A DEITY WHO COMES TO US FROM THE EARLIEST CREATION MYTHS. WAS THE GREEK GODDESS OF THE DAY, THE FEMALE PERSONIFICATION OF DAYLIGHT. "IT WAS HER JOB TO PULL AWAY NIGHT TIME VEILS OF HER FATHER. SHE WAS A DAUGHTER OF" NYX ", GODDESS OF THE NIGHT, AND "EREBUS", GOD OF DARKNESS AND SHADOW. SHE AND HER MOTHER SHARED A HOME BEYOND THE "HORIZON OF TARTARUS "(THE LOWEST REGION OF THE WORLD), BUT THEY RARELY SAW EACH OTHER IN IT. TWICE EACH DAY "HEMERA" AND "NYX "WOULD PASS AT BRASS GATES OF THE "OTHERWORLD," WAVING FROM THEIR CHARIOTS AS ONE WENT HOME AND THE OTHER ROSE TO THE SKY. IN THE EVENING "NYX" DREW A VEIL OF DARKNESS BETWEEN THE SHINING ATMOSPHERE OF THE "AITHER" AND THE LOWER AIR OF EARTH, THUS BRINGING THE NIGHT TO MAN. THEN, WITH EACH MORN, "HEMERA" WOULD DISPERSE NIGHT'S MISTS, BATHING THE EARTH AGAIN IN THE SHINING LIGHT OF HEAVEN ("AITHER"). IN THE ANCIENT COSMOGONIES NIGHT AND DAY WERE SUBSTANCES DISTINCT AND QUITE INDEPENDENT FROM THE SUN. THE GREEK MAIDENS AND YOUTHS DANCE TOGETHER WHEN "HEMERA", THE "GODDESS" OF DAY, APPEARS BRINGING WITH HER THE HEAT OF NOON. "HEMERA" SHARED A SHRINE WITH "HELIOS" AT "KOS", PERHAPS IN HELLENISTIC TIMES, BUT FROM THE CLASSICAL PERIOD ONWARD, THE ATTRIBUTES OF HEMERA WERE LATER ABSORBED BY EOS THE GODDESS OF THE DAWN. "BRITOMARTIS "WAS THE MINOAN GODDESS OF THE MOUNTAINS, SEAS, AND HUNTING. SHE IS ALSO THE GODDESS ASSOCIATED WITH ANIMALS, TRANSFORMATION, REGENERATION, AND BIRTH. HER NAME MEANS "SWEET MAIDEN." BRITOMARTIS IS A VERY ANCIENT GODDESS. SHE WAS THE DAUGHTER OF ZEUS AND CARME, A CRETAN DEMI-GODDESS OF THE HARVEST. BRITOMARTIS WAS A HUNTRESS AND A COMPANION OF ARTEMIS, AND, JUST AS ALL OF THE REST OF ARTEMIS' COMPANIONS, BRITOMARTIS WAS A VIRGIN. SHE HAD NO RELATIONSHIPS WITH MEN. SHE WAS NOT ALWAYS A GODDESS; AT ONE POINT, SHE WAS A NYMPH. 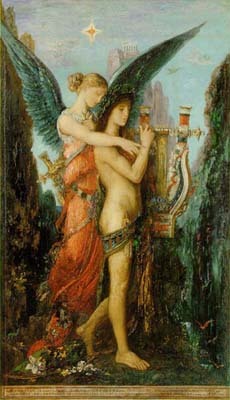 ONE DAY MINOS, THE KING OF CRETE CAUGHT A GLIMPSE OF THE BEAUTIFUL NYMPH AND FELL IN LOVE WITH HER, BUT BRITOMARTIS REFUSED HIM. HE THEN STARTED CHASING HER; HE PURSUED HER THROUGH THE FORESTS, THE MOUNTAINS, THE VALLEYS...FOR NINE MONTHS HE CHASED AFTER HER, BUT SHE ALWAYS MANAGED TO ELUDE HIS GRASP, BUT FINALLY, SHE TIRED AND MINOS HAD HER CORNERED ATOP A STEEP CLIFF WHICH OVERLOOKED THE OCEAN. SHE WAS TRAPPED. SHE KNEW IT AND MINOS KNEW IT, BUT, RATHER THAN GIVE HIM TO HIM, SHE THREW HERSELF OFF THE MOUNTAIN AND FELL INTO THE SEA. SHE WAS SAVED BY SOME FISHERMEN WHO CAUGHT HER IN THEIR NETS...AND, BECAUSE OF HER DEDICATION TO PROTECTING HER CHASTITY, ARTEMIS GRANTED HER IMMORTALITY...AND WITH HER IMMORALITY, CAME A NEW NAME, DICTYNNA, GODDESS OF THE NETS. 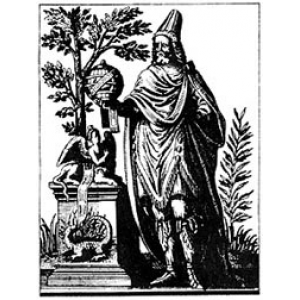 Concerning Apollonius and his remarkable powers, Francis Barrett, in his Biographia Antiqua, after describing how Apollonius quelled a riot without speaking a word, continues: "He traveled much, professed himself a legislator; understood all languages, without having learned them: he had the surprising faculty of knowing what was transacted at an immense distance, and at the time the Emperor Domitian was stabbed, Apollonius being at a vast distance, and standing in the market-place of the city, exclaimed, ‘Strike! strike!—’tis done, the tyrant is no more.’ He understood the language of birds; he condemned dancing and other diversions of that sort; he recommended charity and piety; he traveled over almost all the countries of the world; and he died at a very great age." Wadjet, or the Green One (Egyptian w3yt; also spelled Wadjit, Wedjet, Uadjet or Ua Zit and in Greek, Udjo, Uto, Edjo, and Buto among other names), was originally the ancient local goddess of the city of Dep, which became part of the city that the Egyptians named Per-Wadjet, House of Wadjet, and the Greeks called Buto, a city that was an important site in the Predynastic era of Ancient Egypt and the cultural developments of the Paleolithic. She was said to be the patron and protector of Lower Egypt and upon unification with Upper Egypt, the joint protector and patron of all of Egypt with the "goddess" of Upper Egypt. The image of Wadjet with the sun disk is called the uraeus, and it was the emblem on the crown of the rulers of Lower Egypt. 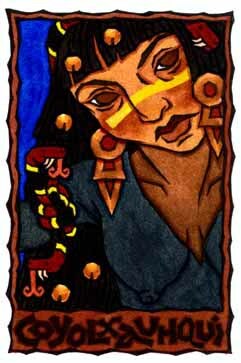 As the patron goddess, she was associated with the land and depicted as a snake-headed woman or a snake—usually an Egyptian cobra, a poisonous snake common to the region; sometimes she was depicted as a woman with two snake heads and, at other times, a snake with a woman's head. Her oracle was in the renowned temple in Per-Wadjet that was dedicated to her worship and gave the city its name. This oracle may have been the source for the oracular tradition that spread to Greece from Egypt. 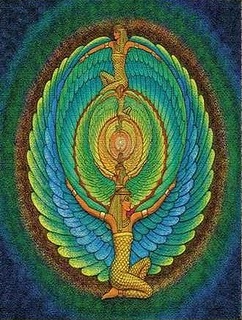 The Going Forth of Wadjet was celebrated on December 25 with chants and songs. An annual festival held in the city celebrated Wadjet on April 21. Other important dates for special worship of her were June 21, the Summer Solstice, and March 14. She also was assigned the fifth hour of the fifth day of the moon.